Training, Fundraising, Team Shirts and the Event. A lot has happened since the last blog entry, with training, fundraising, team shirts and the event. We have all been working hard to get ready for the event and we are now as ready as we are going to be. We have managed to do another good couple of 100km rides and these are gradually getting easier. Andy and myself managed a ride of just over 100km that went from Cardiff through Pontypridd up to Aberdare over the mountain to Maerdy down through Porth, Llantrisant and back to Cardiff. It was a really nice day and the ride was good although we did have a couple of close shaves with cars and were nearly knocked off twice. 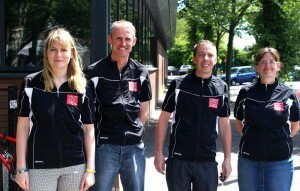 We planned another 100km+ ride over the Velothon course over the late May Bank Holiday weekend. Unfortunately I was unable to make this ride due to a broken back wheel on the bike that I borrowed so Andy and Lara went on this one. They followed the original Velothon Wales course which was 120km. The ride was uneventful as in no mechanicals or scrapes with cars, they rode up both the Tumble in Abergavenny and Mountain Road in Caerphilly which will help them on the day. At the weekend we did our last group ride before the day and decided to go somewhere a little different. Andy, Lara and myself decided to we go to Chepstow for this last ride. 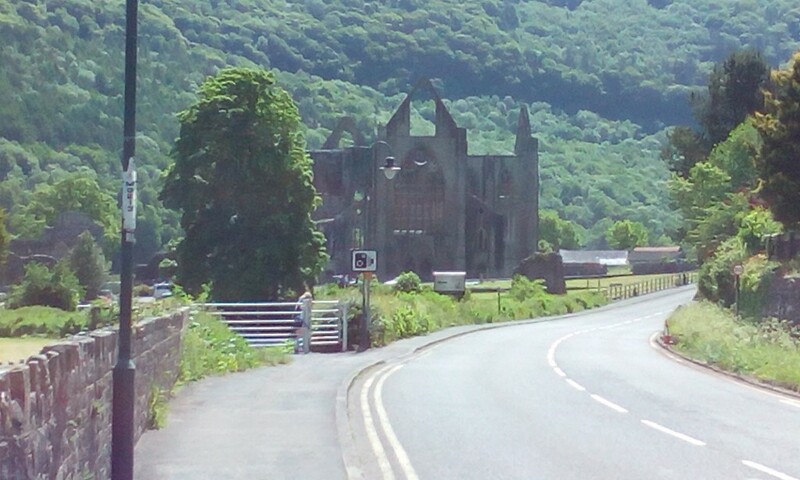 The route we chose had a bit of climbing in it but also followed the river for a while and went past Tintern Abbey. As this was an easy ride we decided to stop for coffee at a little coffee shop just by Tintern Abbey (which surprised Lara) before heading out on the rest of the route. Over the last few weeks we have also been trying to raise as much money as we can for our chosen charities and have done a fantastic job and raised about £2700 for these charities. A big thank you to everyone that has sponsored us it is very much appreciated. Andy went that little bit further with his fund raising efforts and had his legs waxed for the event. He said that it didn’t hurt as much as he thought it would and he now has smooth legs for the day. A big thank you must also go out to Lara for all her efforts in doing a lot of the fundraising and organising the leg waxing. About a month or so ago we were sent a design for the team shirts which all the team liked and an order was sent off to the suppliers to produce this shirts. The shirts have arrived this week and they look very good. We will be riding in these shirts on Sunday so keep an eye out for us. 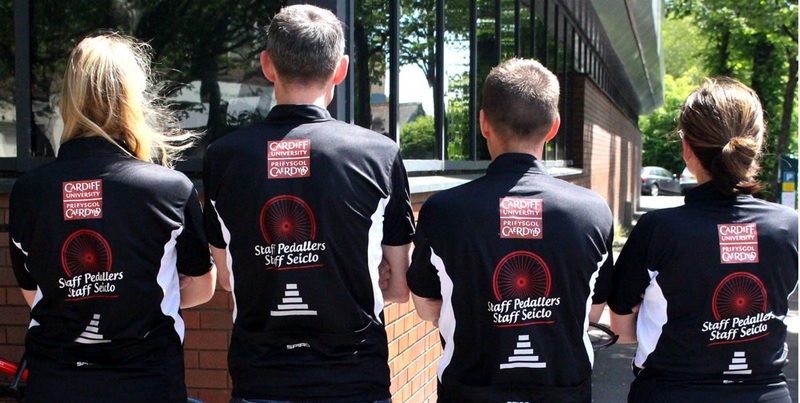 We would like to thank the VC for kindly agreeing to supply us with Cardiff University team shirts and also the Communications and Marketing team for the design and ordering of the shirts. When we signed up for Velothon Wales in November last year it seemed a long way off but we now only have 3 days to go to the event. We are all looking forward to doing the event if not a little apprehensive. We would like to thank everyone who has made a donation to our charities and also everyone that has supported us in the build up to this event. A special mention should also go out to Anna (Andy’s partner) who has come and rescued us on more than one occasion. Look out for our stories from the event itself in the next blog …………………..